Is there a method to display books that display as single title, but has multiple formats? For example I have Through the Looking Glass - it has an epub format and a mobi format. I have other books that have just a mobi format. Is there a method to search for books that have two or more formats in them? I think I explained that clearly - but if not let me know. 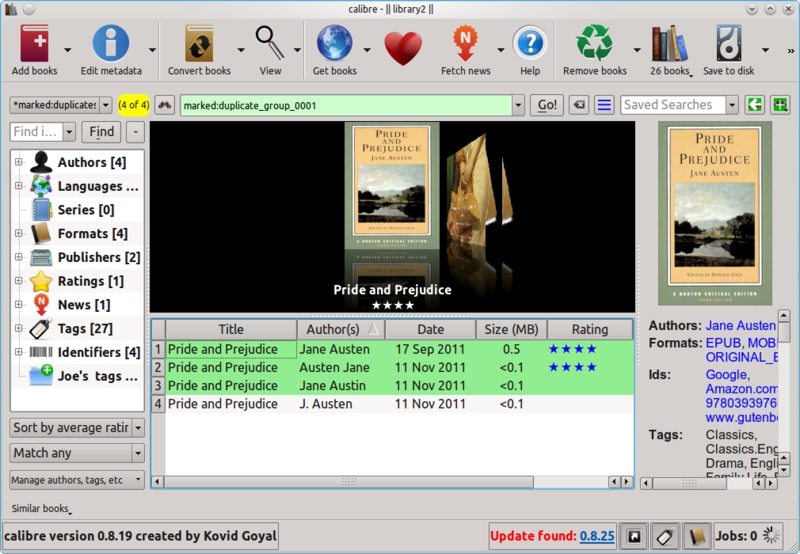 Expand the Formats entry in the tag browser and select the formats say epub and mobi using ctrl. At this point both should have a green + sign to the left of them. Just above the cover browser you will see the typed text "formats:true or formats:"=EPUB" or formats:"=MOBI"". Change that to "formats:true or formats:"=EPUB" and formats:"=MOBI"", i. e. replace the "or" by an "and" and then press enter. Nice plugin. I have too many binary duplicates- Is there a way to auto delete all duplicates? What if the find duplicates plug-in finds a few hundred duplicates. Is there a way to select and remove them all at the same time. I really don't want to go through and individually select and delete each one. 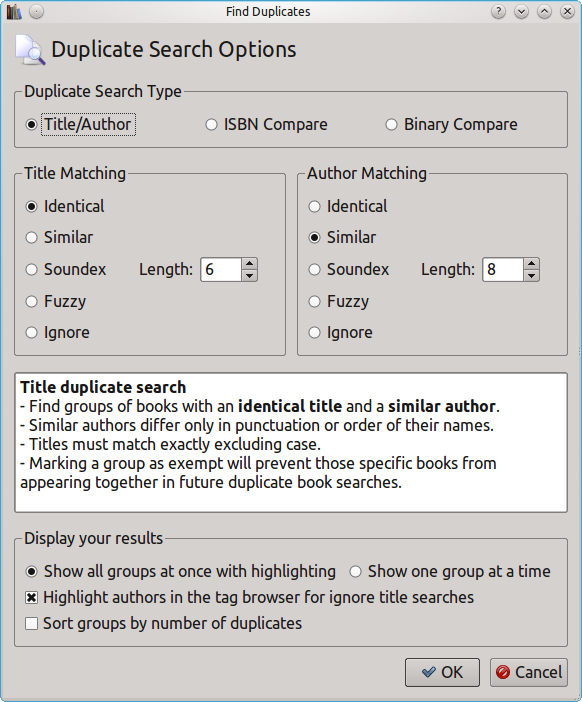 If you do a search for duplicates, and have them come up one group at a time, then you can use ctrl-A to select all, unslect the ones you want to keep and then hit Del. I found the easiest way to remove 100's of duplicates is to create a new library and then add the books from the library with the 100's of duplicates and when asked 'Add Duplicates' say No. You could check the number books in the original library minus the number of duplicates and that should be the number in the new library. I hope that makes sense. I found the expanded 'Remove Books - Files of a specific format' to be the fastest. select ALL the duplicates found, and delete only the .mobi files or the .epub as you see fit. 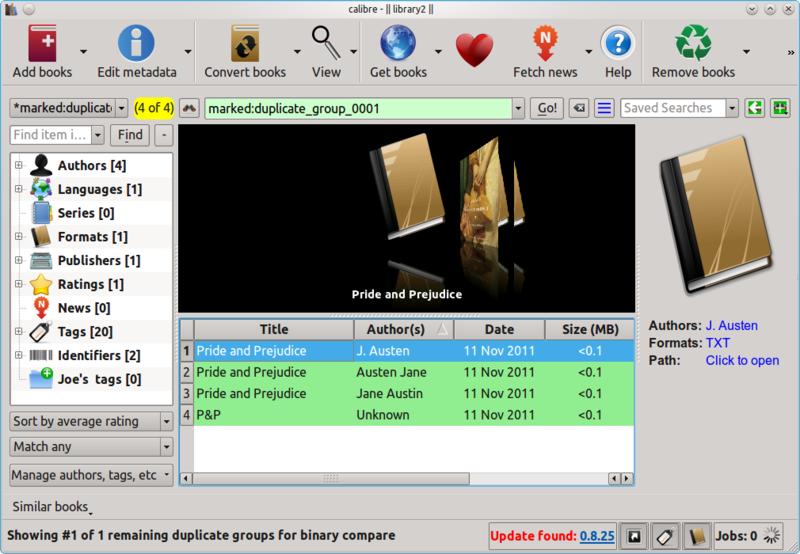 If you are then left with a few remnant books (Books having metadata and covers, but no associated ebook file) sort the same list by size, and erase the zero volume files. I cannot find how to launch the 'Find Duplicates' plug after I install it. Restarted many times, but there is no apparent way in the application to launch it. Update: after reinstalling the plugin, it appears on the right side of the task bar for 5-10 secs after I launch Calibre, then vanishes and cannot be found until I restart Calibre, with the same results again. I added it to mine but have too many icons on top. If you have a double arrow hit that. The icon your looking for should be there. Once it came up I was suprised that I had 5 dups I didn't know about. Is it possible to use this plugin to weed out duplicate authors or variations on author name? My library has gotten rather large, and I'd like an efficient way to combine authors with variations in their names. @Weekendmedic: yes it is. the blog post explains how to do that. i am having a hard time installing the plugin. I am running version 0.8.8 but it keeps tell me i need at least 0.8.57. How do i fix this? Numbering goes as 0.8.8, 0.8.9, 0.8.10, 0.8.11 and so on. Sorry if this is obvious, but I cannot get the Find Duplicates plugin to highlight more than the first duplicate instance. Like T-Roy (January 31, 2012 4:11 AM), I would like to have the plugin highlight all duplicate instances so I can delete all duplicates at the same time, in one fell swoop, rather than repeating a delete on each duplicate. No matter what I do, the Find Duplicate plugin only highlights the first instance. I'll keep plugging away at it, but if you can shed some light on it I'd appreciate it. (I'm dealing with the case where I allowed duplicates to be included when I added some new books. Boy, what the the wrong thing to do). I have the same problem as those above. I would like to know; is it possible to uninstall and reinstall calibre so that it would reuse my library? Would that be a good way to delete all duplicates? uninstalling calibre wont remove duplicates. Is it that you cant figure out how to launch the find duplicates plugin? re-installing calibre will not harm your library in anyway. You can continue to use the library after re-installation. I'm using "Duplicate Files Deleter" for this kind of issue, guaranteed easy fix. Hi! I have many duplicates, but I would like to keep the keywords of all of them when merging them into one book. Is there a way so that I don't have to copy it by hand? Thanks!